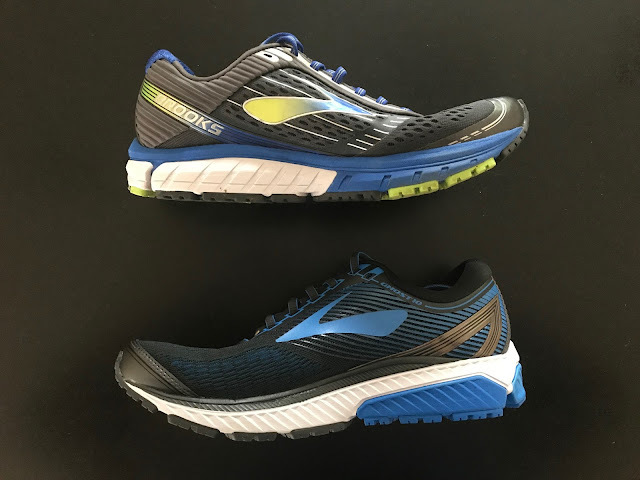 The very popular, and rightly so Ghost series,from Brooks Running will soon see the Ghost 10 ($120). 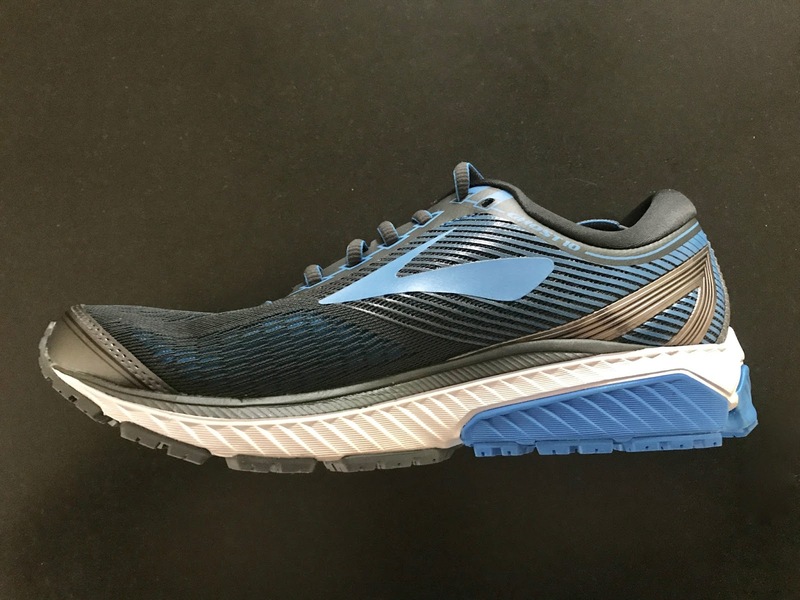 It is a relatively soft, flexible neutral daily trainer with a BioMoGo DNA midsole, a new and very smooth transition, plentiful outsole rubber, and a very fine and pressure free fitting engineered mesh upper with thin 3D Fit Print overlays. Available now. Compared to the Ghost 9 it has a relatively unstructured upper with considerably thinner and more comfortable overlays, especially in the toe box, with the mid foot not quite as securely held as previously. My sample 8.5 is a notable 0.7 oz lighter than the Ghost 9 although the spec from Brooks says the final weight reduction will be 0.2 oz. It is very close in stats to the Glycerin 15 (review soon). The Glycerin features a slightly softer and more flexible midsole, a slightly more responsive fuller coverage rubber and a truly sumptuous and even better fitting upper than the Ghost 10. The Ghost has come a long way since the first version we ran, the 8. 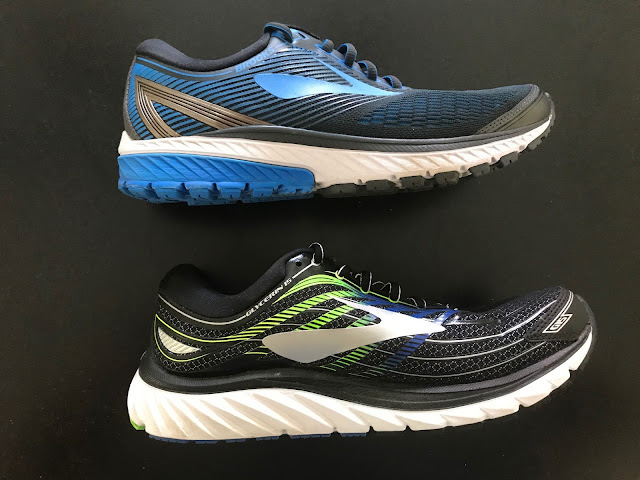 With the Ghost 9 (RTR review comparing the Ghost 9 to the Nike Vomero 12 and adidas Supernova), Brooks gave it a smoother less lumpy ride, an engineered mesh upper, of a sorts... as the overlays including the logo, toe bumper, and especially the piece wrapping the lace holders were thick, stiff, and shiny. Fans of the 9 will feel right at home in the 10 and appreciate its smoother if a touch softer front transition and great front of the shoe execution but some may find the mid foot a touch less secure with low volume feet. The Ghost 10 fits me true to size as did the Ghost 9. I am able to run sock less in the Ghost 10, something I did not dare with the 9 with no issues beyond not quite as secure a mid foot hold as the 9. The Ghost 9 overlays when compared to the much thinner 3D FitPrint approach in the Ghost 10 feel crude in comparison especially over the last lace up. Notice how the thick silver colored lace eye stay press down over the toes in the Ghost 9 and sits flat and thin in the Ghost 10 in the picture below. The bulbous toe cap is significantly reduced in the 10. Both of these improvements are clearly felt running with one shoe on each foot and have me running sockless in the 10 something I would never consider doing in the 9. The Ghost 10 is not nearly as flashy as the 9's as the overlays are thinner and not "iridescent", good riddance I say to that flash. The thick gray heel collar overlay is gone as is the rest of "decorative" looking over padding at the foot opening to reinforce the foot hold now replaced mostly with 3D FitPrint overlays. All of this simplification of the upper certainly is a part of the reason the weight of my sample drops 0.7 oz/20 grams, a significant amount for a shoe which under foot is almost identical at least in stack heights. The fit of the Ghost 10 is impeccable up front and at the heel for me. Plenty roomy with no slip or slop. Things are looser at mid foot due to the more minimal overlays. Losing all those thick heavy logo overlays makes the fit a bit more unstructured there. Nothing to really be worried about as this is a daily trainer and those with high volume feet will be happy but I wish for a bit more side structure. Swapping the 9's flat thin laces for a sausage type helps mitigate somewhat and helps secures the foot. Even lacing snug sees no pressure with the tongue only slightly less padded in the 10 than 9. The midsole gets a new rear "Crash Pad", the blue heel module in the picture above and below. The blue crash pad feels slightly softer than the main white portion of the midsole. We also see a simplification of the overall midsole by eliminating the thicker blue BioMoGo layer near the foot in the 9 replacing it with the main cushion layer of BioMoGo DNA and then adding a slimmer dark gray side "roll bar'' to add some stability we assume where foot meets midsole. Overall midsole layers all feel slightly, very slightly softer than in the Ghost 9, particularly in the forefoot. The outsole of the Ghost 10 (blue heel above) is very similar to the 9 and of similar rubber firmness as far as I can tell but there are some differences to note, particularly in the forefoot. The 10's black outsole rubber upfront is not only segmented into more pods but between pods the gaps are deeper. Brooks calls out a "Plush Transition Zone" at mid foot which appears to be the deeper grooving with segmenting at the first pod of black rubber on the medial side. Its purpose was felt as the transition off mid foot was noticeably smoother and more fluid. This, along with what feels like a slightly softer midsole, leads to better flexibility but also to a less responsive front of the shoe feel, less of a sense of full contact and pop on toe off for the 10 when compared to the 9. The Ghost 10 improves, gradually and carefully without radical changes. The miles go by easy and well cushioned at any moderate pace in this shoe. With the Ghost 10, the direction is to lighter weight and comfort with a somewhat roomier and more accommodating upper featuring a greatly improved toe box using engineered mesh and the 3D Fit Print. On the minus side, the mid foot hold slips a bit but nothing overwhelming or a show stopper. The transitions are noticeably more fluid due to the new heel crash pad and the new mid foot transition zone. The heel is a touch softer and has none of the lumpy feel of prior Ghost, even when compared to the 9 which was much improved over the 8. The forefoot midsole contact could be firmer and return some more pop as the 10 loses a touch of zip despite the now excellent transition and flexiblity when compared side by side to the 9 one on each foot. The Ghost sits somewhere between categories for me. At a 12mm drop it is in a drop category I rarely run these days but its big drop is certainly less noticeable than the Mizuno Wave Rider 20's. 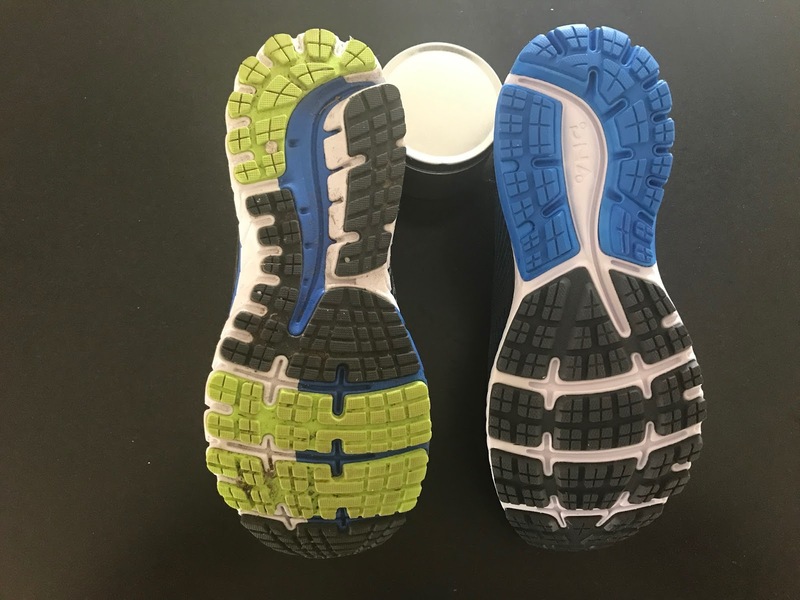 For a zippier yet still well cushioned ride I would reach for the 10mm drop Launch 4 (RTR review) which essentially shaves 2mm off the heel stack keeping the forefoot stack the same and as a result also losing weight down close to 9 ounces or almost an ounce less than the Ghost. 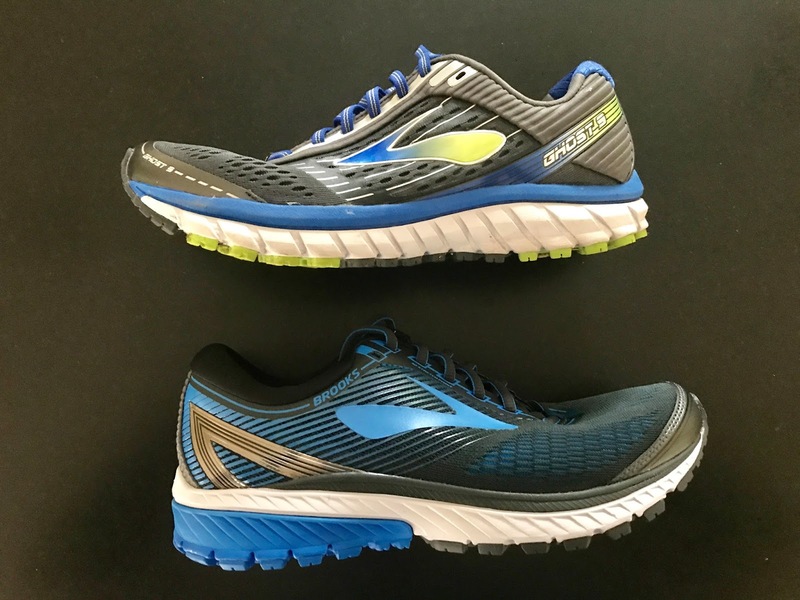 For longer easier days I might prefer the Brooks Glycerin 15 (review soon) for its sumptuous overall feel from its mesh upper, which is also more secure than the Ghost 10 at mid foot. Despite its greater overall softness its fuller contact firmer outsole rubber makes it actually snappier up front than the Ghost. -0.15 for soft forefoot feel and lack of snappy forefoot contact and response. The Ghost was provided at no cost. The opinions herein are entirely the author's. Sam is a 1:38 half marathoner on a good day and doesn't mind at all going into a new decade age group in 2017. He runs approximately 40 miles per week. He is the Editor and Founder of Road Trail Run and has been running for 45 years and has a very dated marathon PR of 2:28. Sam is also the Senior Contributing Editor for Wearable Fitness Technology and Music at Competitor Magazine. I'm thinking of trying the Ghost 10's. I am a neutral runner and have been trying every shoe known to man lately because I have a tailor bunion on the outer edge of my left foot that seems to get aggravated at everything. I have had some success with the Launch 4's, and it doesn't irritate it too much. I am looking for a bit more cushion and support however for longer runs. Would this be a decent option? Any thoughts/suggestions are appreciated! Well you might not believe this but I have tried both the Glycerin 15's and the Zealots. Loved the Zealots but on the bottom outside edge of my foot it just rubbed it very uncomfortably. I would like to find another shoe like that. Feel like I'm going crazy..haha! Thanks for your help. Keep_Moving09, Zealot ISO 3? It's new and not quite out yet. Very different upper. Also when shoes and especially the sock liner are new they need some packing breaking in. Especially under the arch with bootie type uppers. Yes, the Zealot 3's. I was able to find them at RunningShoes.com. It's not in the arch area that I have trouble...it is on the outside edge of my foot where I was having issues. The bottom just felt a bit hard in the forefoot even with my inserts. I was actually surprised. Interesting Keep_Moving. I see feeling inside the Zealot 3 there is a ridge of midsole without the sock liner which can be felt mainly I think as the upper is so pliable. If your insert is flat up front without the slight cupping of the stock one I could see how that could happen. Felt inside the Ghost 10 and the interface between the midsole and upper is smoother and the mesh denser. Ok, that makes sense. The only other one I was considering was the Hoka Clifton 4. Would that be a better option? Thank you! The Ghost 10 is disappointing compared to previous models. It is soft to the point of being mushy, and the loss of any stability whatsoever in the midfoot makes the shoe feel much less stable than its predecessors. I've also seen several pair in stores that have glaringly obvious flaws; big glue spots on the fabric uppers; inadequate lamination of midsole materials; and uneven application of the outersole. I think Brooks has finally fallen victim to its own desire to deliver a shoe with lots of tech, but below a certain price point. My guess is that Brooks is going already working on a fix for the 10, and designing the 11 in hopes of getting it out there ASAP. Note on their website that the description for the Ghost 10 is a single sentence; not exactly a sales pitch for a shoe that they are well aware has some major issues. I was a wear tester for this shoe. so would you recommend spending the extra money and buying the ghost 10s instead of the 9s? Thanks for writing! What have you been running in and what do you like dislike about those shoes? The differences are when all is said and done fairly slight. If you think the description of differences in the review are significant enough for you to spend the extra money on the Ghost 10 go that way. If not Ghost 9 is fine. Do you find the toe box area points up too much on the Glycerin 15? I tried them on and found that to be a bit annoying. I did not find that too be the case with the Ghost 10. I have the 10s and have been happy with them. Never wore Brooks before. I need to get a second pair to rotate them. It’s hard for me to spend so much on shoes though. Was thinking of getting a pair of the 9s for the second pair. Do they fit the same? I had to get a wide in the 10s.